Are you preparing for a home birth? There are few things that need to be done in order to have more pleasant, joyful and stress free birth experience. Before you decide to have a home birth, it is a good idea to educate yourself as much as you can about the pros and cons of a home birth. Learning about the process of birth will help you feel more confident and positive. Many women spend months of researching about home births and other natural birthing methods. Watching documentaries and home videos about natural home birth is also a good source to learn and to visualize your own birth. One of the most important reasons for educating yourself and taking a birthing class is to loose the fear and gain much needed confidence. 1. Online Natural Birth Class are for couples who want to learn as much as possible about natural births. I did take this course and “blamed” it to be the reason why I had a 100% better natural birth. The information is fresh, the research is up to date and it is very enjoyable to watch the DVD which is like a documentary with the interviews of obstetricians, midwives, doulas, chiropractors and other couples who are sharing their natural birth stories. Read Birthing Class Tips From Childbirth Class “junkie”(me) to learn more about these classes. 2. The Pink Kit is one of a kind natural childbirth class online. It actually teaches you the birthing skills. Yes, you CAN learn how to birth better. There are a lot of information in there which you can’t find anywhere else. the best places to massage when you are pregnant, that way you body will open easier for the coming baby. the best way to not “lose it” during long and painful contractions. the best techniques that teach how to handle interventions. Please read Birthing Techniques to learn more about The Pink Kit and how I used its brilliant birthing skills. 3. Bradley Method of Natural Child Birth is one the oldest natural birthing methods which advocates husbands/partners as birthing coaches. You will learn about various relaxation methods which will help with the pain during labor. This class is great because it will involve your partner into the whole pregnancy and birth experience. 4. Lamaze Breathing Class focuses on breathing as a pain reduction strategy. 5. Orgasmic Birth will change your perspective of painful childbirth. It can actually be a mix of pain and pleasure. It is proved by science and it does make sense when you learn more about women’s hormones that work during labor and birth as well as the the women’s anatomy. Of course not every women can achieve orgasmic birth, but if you follow some recommendations, learn some techniques you definitely increase your chances having a pleasurable birth. Finding a midwife for your home birth is one the most important things you have to do prior your home birth. Actually you should find one early in your pregnancy. Before you choose a midwife you should know little about them. There are 3 kinds of midwives. Knowing their education and experience you can make an informative decision. These nurses are trained and they have studied midwifery. Basically she is a Nurse and a Midwife and is educated in nursing and midwifery. Certified Nurse Midwives are certified by the American College of Nurse-Midwives.They work mostly in the hospital and birth centers. Only few practice in home births. CPM nurses have passed the exams and got certified by North American Registry of Midwives. They work in birth centers and at home births.In some states the practice of these midwives is illegal. Check with www.Mana.org to see what are the laws in your state. An independent practitioner who has learned the skill of midwifery through study, apprenticeship, a midwifery school or college that is not a nursing program.They may be certified by the North American Registry of Midwives, and their legal status varies from state to state. A few direct-entry midwives are certified by the ACNM and are called certified midwives (CMs). When you know which kind of midwife you want and which one is available (and legal) in your area it is time to choose one by interviewing them. Here are some questions you could ask when you meet a midwife. – How many births do you attend per month? – How many clients required C-sections, episiotomies, suturing? – What types of interventions do you use? – What are the disadvantages of homebirth? – What complications/emergencies have you or can you handle? – Under what circumstances do you transfer to a hospital? – What percentage of clients have cesareans in your practice? – What is your transport rate? – What is your mortality rate? – Do you have any apprentices? Who else may be at the birth? – Who is your midwife backup if you are unavailable? – What is her experience? – Who is your consult physician in case of hospital transfer? – Can you accompany the couple through the hospital birth? – What is your schedule for prenatal care visits? – What nutrition counseling do you provide? – What are your feelings about birth preparation classes? – Do you visit the home at any time before the birth? – What do you consider high risk? – When do you want to be called once labor has begun? – When do you come to the home once labor has begun? – What equipment do you bring and what must we provide? – What emergency equipment do you provide? – How do you view the father’s role? – What is your role during labor? birth? – What measures do you suggest for pain relief? – How often do you monitor the baby in labor? – What is fetal distress in your opinion? – What do you consider prolonged labor/birth pushing? – Do you have preferences for labor/ birth positions? – How do you feel about water birth? Have you attended any? – What measures do you take to prevent tearing? – Do you have local anesthetic & suturing equipment for this repair to be done without going to the hospital? – How do you prevent/treat excessive postpartum bleeding? – How do you handle the baby immediately after birth? – How long do you stay after the birth? What do you check at this time? – Who cleans up the mess? – What is your schedule for follow-up care? – What is your philosophy regarding circumcision? – How is the filing of the birth certificate handled? – Do you routinely give me a copy of all my records after the birth? – How much do you charge for your services? – What services are not included in this fee? – When do you want the full fee paid? – Do you do insurance billing? Natural home birth is very personal and intimate event in your life. Make sure you and your midwife “click” and have a strong connection. After all, she will be helping your birth your baby! Don’t worry about your house being small or not the “birth kind”. The most important things is for your to feel safe, cozy, powerful and intimate. Here are few things you can do to prepare your home for a birth. 1. Choose the biggest room in your house. Store all the things you need in it during your birth. Make sure the room is not cluttery and is close to the bathroom. 2. Have the house cleaned. 3. Wash everything that may come into contact with you and your newborn when you give birth at home, and store in plastic bags to ward off dust and debris. 3. Cook some meals and freeze it. 4. Get all the birthing supplies ready. 5. Get the car ready. Even if you are giving birth at home it is a good idea to have a full tank of gas, car seat and a bag for a hospital. Just in case! 6. Cover your bed with waterproof sheeting. Use Protective coverings for floor and furniture or just use clean shower curtain. 7. Create calm atmosphere with your favorite soft, relaxing music, dimmed lights and massage oil. Having your child/children at your home birth is a very personal decision. However, home environment is the best one for a child to witness a birth. Here are few tips to help prepare and normalize the birth for your child. 1. Involve your child in the process of preparing for the birth. Take him to your prenatal appointments. Hopefully he will meet your midwife there and will see some of the procedures done to you, so later he will be more comfortable when the midwife is touching you at birth. 2. When you are getting birth supplies, show and explain various things and what they are for. Here is an excellent book that our family enjoyed. 3. Arrange a babysitter for your labor and birth. The best would be to ask a family member to watch your child. Even if the child will remain with you during the labor and birth it would be very helpful to have a person who would care for the child’s needs (especially if he is younger age). Labor might be long, so someone will need to feed the child, to take him to the park, to put him to sleep, to play with him when he is bored.4. Watch some pictures and videos online about home birth. The visual and vocal aspects will help your child imagine the birth better. Get ready for some questions! 5. Be honest and open about human body’s anatomy. Talk about the difference of women and men bodies. This needs to be done in order for a child to understand how “does the baby come out”. 6. Talk to your child about his birth. Show pictures/videos if you have. Explain all the details. Kids love that. It is very important to prepare your life partner for the home birth. Many women feel that birth is natural process. Men, on the other hand, feel quite different and many times are just fearing the whole home birth idea. 1. Your partner has to be fully comfortable with the decision of giving birth at home. This includes researching about home births together. Knowing the pros and cons of it will help him feel more confident too.2. Involve into the preparation for a home birth as much as you can. 3. Attend a childbirth class or get one online. 4. Watching some videos and pictures can also be helpful. Documentaries such as the “Business of being born” or “Organic birth” will definitely boost your partners enthusiasm. It will especially help those dads who “don’t feel comfortable you giving birth at home”. In my opinion the mental status and “readiness” for a natural home birth is one of the most important things. Dealing with the huge pain and sometimes a lot of fear and/or panic requires strong mental preparation. So whether your birth is easy or difficult you need some mental preparation. Here are few ideas that helped many mothers to prepare mentally for a home birth. 1. Hypnobabies Home Study Course is childbirth course that teaches “eyes-open childbirth hypnosis”. You still remain deeply in hypnosis while walking, talking and changing positions. You can also be as mobile as you want during your birthing process. After you learn all the techniques that Hypnobabies course teaches you should be able to have easier, shorter and more comfortable birth. And it WILL be more enjoyable experience. 2. Learn the actual process of birthing a baby: why do you feel contractions, how do they affect your labor. Knowing what kind of hormones and what do they do to help your labor is also very important. 3. Set up the birth space to your liking. Considering your are giving birth at home it is not that difficult. Some women even paint the walls different color. 4. Watch inspiring birth videos and documentaries. I found the Orgasmic Birth DVD especially helpful to me to prepare my mind and reassure the reasons why do I want to give birth naturally. If you are planning to give birth at home with a midwife, you should talk to her and discuss what things does she bring and what do you need to have. Many things you will have at home already. You will just need to get them ready in one spot. Some mothers are OK with least and only most important things, while other women prefer to have everything, just in case. Here are basic things you should have for your home birth. If you decide to give birth or use birthing pool for your labor you will need some extra preparations. Preparing physically for your home birth is no different than preparing for a natural birth. In fact, being at home makes it all easier because you can walk, get in the water, eat and drink and pick your birthing positions. It is easier, but not easy! Labor and birth requires a lot of physical work and endurance. It’s like running a marathon. You would not run one without a proper training, right? Even various studies have proved that fit women have easier births. But it doesn’t mean that you have to sign up for a marathon and start heavy exercising. 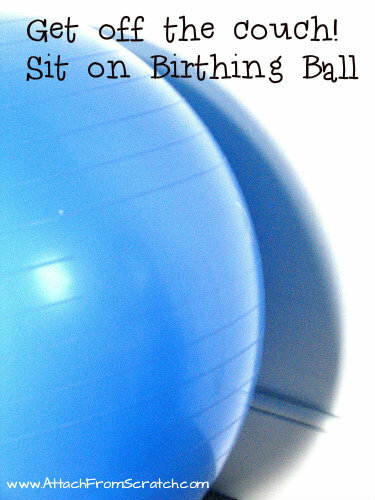 Many expectant mothers (including me) found birthing ball to be very helpful to exercise. Preparing for a home birth should be as relaxing as possible. To avoid panic, stress and other unwanted feelings start early, but go slowly and naturally. Follow your instincts!